When the world is wondering what is the latest mega project in the Land of the Hornbill – Sarawak, the answer will be the 2,333km long Pan Borneo Highway (1,089km long highway on Sarawak side) stretches from Telok Melano at the southwestern tip of Sarawak to Serudong in Sabah across Brunei. “Efficient Connections” had been the key motto of the mega project. This ambitious project not only to upgrade the existing road infrastructure, but also improved connectivity inter-state and inter-country, that will be the game changer that will catalyses the economic growth along the north coast of Borneo Island, which forms the backbone of the Northern Economic Corridor of Borneo Island. Borneo Island is the third largest island in the world (after Greenland and New Guinea) spanning an area of 743,330 square kilometers. It is also the Largest island in Asia. The North Coast of Borneo Island is shared by Sarawak, Brunei and Sabah (Sarawak and Sabah is part of Malaysia), while the other part of the Island on the south is occupy by Kalimantan Indonesia. The North Coast of Borneo is adjacent to the South China sea, which is the major shipping route which carries one third of the world’s shipping passes and connects many major international ports. Shipping trades as far from Europe nation can pass through straits of Malacca and Taiwan via South China Sea to trade with China, Japan and Korea. The South China Sea is also known for its fisheries and natural deposits of natural gas and petroleum. The Borneo island’s economy is mainly depends on Agriculture, Logging and Oil & gas. Borneo is rich with natural resources, scattered around deep forrest and sea. At north Borneo, Sabah and Sarawak is famous for exports of Timber, liquified natural gas and petroleum while Brunei is the largest oil producer of oil in Southeast Asia. Sarawak also famous for oil palm, black pepper plantations while Sabah famous for rubber, cacao, vegetables, and for its fisheries. Along the north coast of Borneo there is also few sea ports available, major ones are like Kuching, Sibu, Bintulu and Miri in Sarawak; Labuan, Sandakan, Tawau and lahad datu in Sabah; Kuala Belait and Seria in Brunei. Other than agriculture, oil and shipping, the North Borneo have two major hydroelectric dams in Sarawak namely Bakun dam and Batang Ai dam. These two power generating behemoth generates massive amount of renewable energy for the growing cities and industries along the north coast. Furthermore with natural parks with native preserved rainforest, world recognized prehistoric caves , beautiful natural coral reefs , relaxing sun scorching beaches , all forms a ecotourism backbone of the north Borneo. Hence it is crucial in connecting all the north Borneo developing zones in order to create a economic powerhouse. The Northen Economic Corridor is imminent in near future, and the Pan Borneo Highway projects will accelerate the development. The North Borneo and the Pan Borneo Highway. Along the North coast of Borneo Island, there are many scattered cities and towns with many independent agriculture, commercial, and tourism zones. However there had been many challenges to connecting all of them efficiently due to uneven terrains and huge rivers. For decades, many had travel the mountainous roads with dangerous curves and steep downhill roads. The federal route, part of existing trans Borneo Highway is mainly a 2-lane single carriageway, which limits the carriage capacity. Due to the nature of the terrain, many of the routes are not suitable for overtakes and fatal road accidents are not uncommon. Among the ussage of the roads are oil tanker trucks, timber trucks, cargo lorries, car carrier trailers, palm oil carrying trailers, long distance tour busses etc. These posses traffic dangers to the smaller vehicles when comes to winding 2 lane single carriageways. Major terraforming is imminent for a upgrade to 4-lane double carriageway as many of the existing roads are steep and winding around hills, which is not suitable for high speed travels. Rivers been known to connects many of the in-land towns and villages. The Rajang River is one of the largest and longest river in Malaysia with approximately 563 km length, connecting various towns along the rivers namely Sibu, Kanowit, Sarikei, Bintangor, Song and Belaga. To build bridges across this mile wide river is a great challenge. Another great challenge is the 3 miles wide Batang Lupar river that is known to have frequent tidal bore. There are many other rivers along the north coastline that challenge the road building along the coastline to connect all the towns and cities. This also making Sarawak as one of the state with most airport in Malaysia. The major airport are Kuching International Airport, while the smaller airports are Miri Airport, Sibu Airport and Bintulu Airport. There are also minor airports scattered around deep inland like the Mukah Airport, Mulu Airport, Bario Airport, Kapit Airport, Marudi Airport, Lawas Airport, Limbang Airport and many more. Sarawak being the biggest state in Malaysia and full of natural resources is in desperate need for upgrades of the current infrastructure in order to grow and compete with other parts of Malaysia. It is predicted that the economy will grow as much as eight times its present level when the Pan Borneo Highway is completed in 2030. The Sarawak state government has formulated the Sarawak Socio-Economic Transformation Plan (SETP) covering a period of 15 years, starting this year until 2030. The main purpose of this plan is to ensure Sarawak achieves a high income and developed status by 2030. It covering all sectors of the economy including the development and introduction of roads, airports, ports, water, electricity, telecommunications, information and technology (ICT), healthcare, and education infrastructures. This plan will minimized the developmental discrepancies between Peninsular Malaysia and East Malaysia, so that Malaysia as a whole can work together towards a developed nation in the near future. The plan will be executed in phases starting with the 11th Malaysian plan. The Pan Borneo Highway Project is one of the keystone in achieving the Socio-Economic Transformation. The origins of a planned trunk road connecting the expansive states of Sarawak and Sabah with Brunei in between date back to the 1960s when it was known as the Trans-Borneo Highway. Since then the connecting trunk roads are build gradually. As of 2002, about 95.2% (997.18 kilometres) of the highway has been completed. However most of its federal route still mainly a 2-lane single carriageway of JKR R3 standard design. Travel across the vast state of Sarawak continues to be a long journey – up to 19 hours from Sematan to Miri currently. To improve connectivity, an imminent upgrades need to take place, and hence the Pan Borneo Highway project takes off. The Pan Borneo Highway was first announced by Prime Minister Datuk Seri Najib Tun Razak in April 2013 as part of Barisan Nasional’s manifesto during the 13th General Election and it was later formalised in Budget 2015. The Pan Borneo Highway project was devided into multiple phases and upgrading sections. The entire project, estimated to cost RM29 billion, is expected to be completed in 2023. The Sarawak portion of the highway project will involve the upgrading of 779km of single carriageway to dual carriageway and construction of many new bridges across rivers and flyovers/interchanges. The Pan Borneo Highway project had been devided into 11 packages. At current stage, three packages have been launched between Sept 15 last year and April 17 this year. They have started the construction of the highway between Telok Melano and Sematan, Serian roundabout to the Pantu junction and the Bintangor junction to Sungai Kua Bridge. The Pan Borneo Highway project takes off with a great momentum. A maga project is never being simple. It is like a great bulldozers grazing over the landscape, moving away hills and filling up valleys. So how does it actually happen ? Along the existing trans Borneo roads, there have been many developed houses, villages, farmlands and infrastructure, which is very close to the trunk road. Furthermore the existing trunk roads are not straight, they had been curve around hills and valleys. To have a straighten roads may means moving hills and flattening valleys which involve in massive sum of money. To straighten and upgrade current trunk roads requires moving hills and also residential and non-residential structures. These challenge the upgrade of the carriageway. Upgrading the roads from 2 lane to 4 lane doesn’t means just adding an extra lane each side. In order to have a effective high speed carriageway, winding roads must be straighten. The effort of straightening them effectively cause the expansion of work area 3 or more times its initial area. This also causing many of the preexisting road side structure to be removed. The initial aim for expansion is to remove non-residential structure in the vicinity of the projects, including residential gates and gardens. However the upgrades also pushing the trunk edge dangerously close to the residential doorstep. Hence many had to abandon their home and rebuilt it at different location. Mostly affected are scattered independent farm housing that is not properly planned initially. At some area where major changing of landscaping (removing hills along the highway) and earthworks to build the dual carriageway is required, houses and farms are removed. House owners in these area received compensation or ex-gratia payments and are advised to move out and vacate the area as soon as possible to avoid any future complications. It is clearly seen along the Serian-Pantu Junction road where many houses are evacuated and demolished. Even landmarks structure are not spared. The durian landmark of Serian are force to relocated in the wheel of development of the Pan Borneo Highway. Some of the schools, clinics and religious buildings are spared from destruction, however some of the non building structures like gates and fence are relocated. With a 4 lane double carriageway highway, there are limitation for pedestrian crossings. Many trees and area are clear off in the way of the highway projects. Exposed earth and bare lands is now a common scene along the highway project. Road users are advised to be careful while driving as there may be detour to the existing roads. In the long run, all this limitations will be offset by a greater benefit from the economy and connectivity, as the motto sounds “Efficient Connections”. It reduce the numbers of sharp curves and winding road, which increase safety during travel. Shorter and smoother highway will allow road travel to be faster across Northern Borneo. It is a toll free highway in Malaysia, and this will have added benefit for lower cost of transportation in the long run. So lets us anticipate the completion of the Pan Borneo Highway by 2030 and successful socioeconomic transformation to the Northern Borneo Economic Corridor. 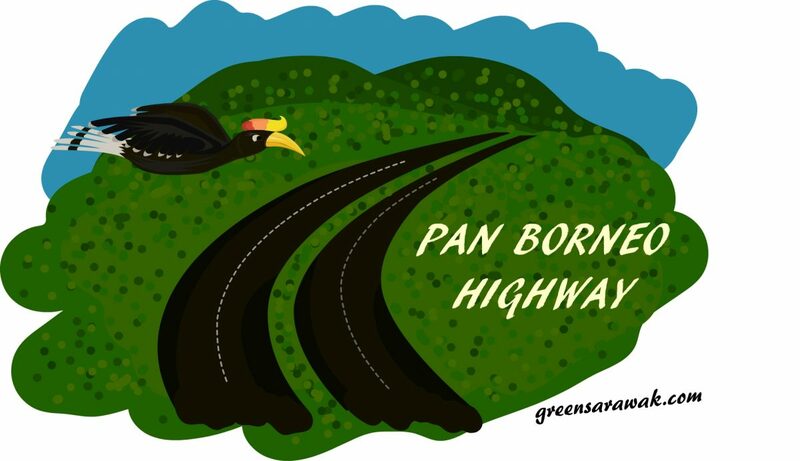 Why Sarawak's Pan Borneo Highway is Toll-free ?